Drop me a note at michael@k-mac.org, or share your thoughts with me on Facebook. You can find the darnedest things on the Internet. I finally got around to registering on Goodreads as an author, and in looking through the listings linked to my name I found a publication which was completely unknown to me. 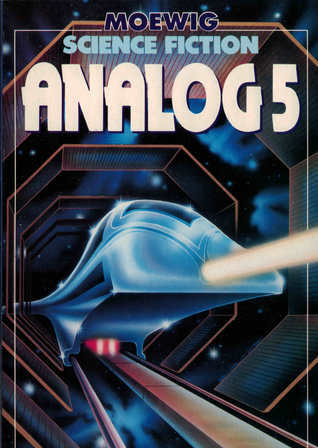 It’s a 1982 German anthology titled ANALOG 5 which contains a story of mine, “Eine Frage der Veranlagung.” The English title was “A Question of Compliance,” and it appeared in the June 22, 1981 issue of ANALOG–my first story there. Virtually no chance of scaring up a copy for the brag shelf at this late date, of course. ☺ There’s a copy for sale on amazon.de, but it doesn’t appear the seller ships internationally. Maybe I have a fan in Germany who could do me a solid? The news that Jerry Pournelle passed away this afternoon is spreading across social media tonight. Over the last hour or so, I’ve been reading remembrances of Jerry by the likes of David Gerrold and Ray Feist and realizing how incomplete my picture of the man was. I knew the Jerry Pournelle of “Chaos Manor,” his long-running, influential and idiosyncratic column on personal computing in BYTE magazine. Especially early in the PC era, his opinions carried considerable weight in the industry. I still own one of the special “Pournelle keyboards” produced by Northgate in response to Jerry’s commentaries on keyboard layouts. As a long-time L5 Society and NSS member, I knew Jerry Pournelle the passionate space development advocate. His contributions in this area were recognized in 2016 when he received the National Space Society’s Heinlein Award. As an SF fan, I knew Jerry Pournelle the novelist. The first of his novels I read was KING DAVID’S SPACESHIP. The best of his novels I read was his first collaboration with Larry Niven, THE MOTE IN GOD’S EYE. I have several other of his works on my shelves (despite my limited appetite for military SF and conservative politics). As a writer, I got glimpses of Jerry Pournelle the con personality–on panels, in the green room, in an elevator, at SFWA meetings, in the SFWA suite. I found that Jerry to be brusque, opinionated, and–frankly–more than a bit intimidating. Consequently, I’m fairly sure I never tried to engage him in conversation, or even asked him to autograph a book. And I remember the only time I ever saw Jerry Pournelle at a loss for words. In a very crowded SFWA suite (at a Norwescon, I think), he took note of Algis Budrys, the respected writer/editor/reviewer, seated on a couch. Looming over Algis with drink in hand, Jerry started griping about the review A.J. had given one of Jerry’s books. Algis listened impassively, then said, “Jerry, I will tell you what the problem is with your stories. Too much pushing and shoving.” End of conversation. Of course, Jerry has vast numbers of fans who’ll heartily disagree. FOOTFALL (also co-written with Niven) went to #1 on the NY Times bestseller list. LUCIFER’S HAMMER made it to #2. My condolences to Jerry’s family, friends, and other fans. His life changed the lives of uncounted others, from Korea to Washington DC to fandom, and he and his works will surely not be forgotten.